A personal record of my walk of Hadrian's Wall National Trail with written journal and photographs. Tracklogs for GPS units and for use with Google Earth are available for download for each stage. The Walk: After Steve had driven up to Harrogate on the day before and after an evening out in Harrogate listening to live music in the famous Monpellier Street Blues Bar the three of us (Steve, Dave and I) met up at Harrogate Railway Station to travel to Newcastle Railway Station and then on to Wallsend. The weather was set fair and I remember enjoying looking out of the window at a dry scene of the Northern English countryside, a rare sight in 2012 which will probably go down in history as the summer that never was. Still, there were glimpses of summer in even the most disappointing season as this report of the Hadrian's Wall walk will prove. 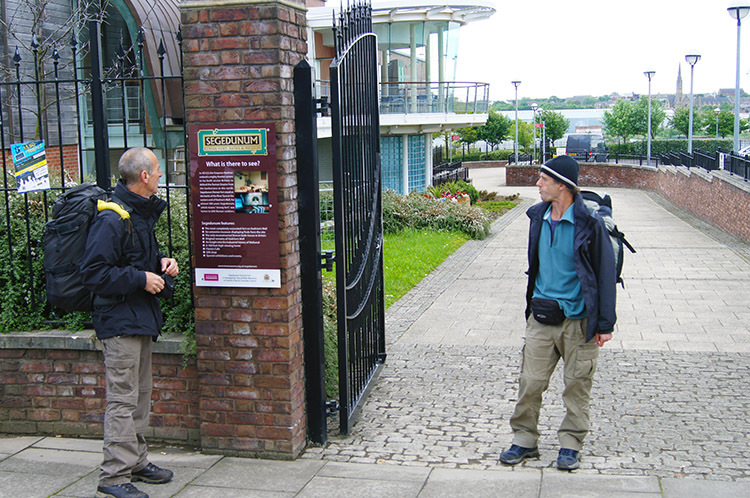 When the railway travel was over we disembarked at Wallsend, found our way to Segedunum and after Steve collected a route map we were on our way. Our walk of Hadrian's Wall, from east to west began with a brief introduction to the history of the wall provided by the National Trust lady on duty in Segedunum Fort. We had to walk though the shop to access the start of the path anyway so a polite short exchange of words was a nice preamble to setting off on our journey. Segedunum Fort lay at the eastern end of Hadrian's Wall forming the eastern-most portion of the wall. It was in use as a garrison for approximately 300 years, almost up to 400AD. Hard to imagine now. As we walked off on a modern footpath we saw no sign of any remains, there are none, only a short man made imitation near the start of the path which we used as a seat to have a bite to eat before setting off. 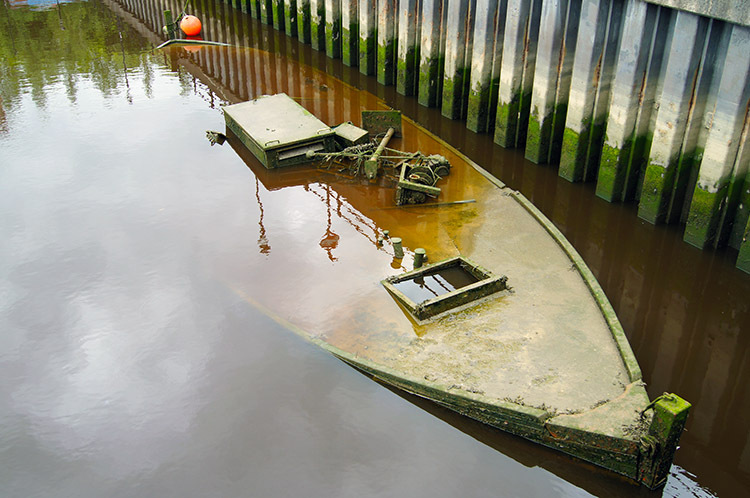 From the start we were close to the river, albeit elevated above the water with old shipyards and a few rotting hulks in sight from the start. Not particularly an eyesore though, that was reserved for the masses of litter strewn on the path and beside it too. The usual urban fare. We passed by disdainfully. 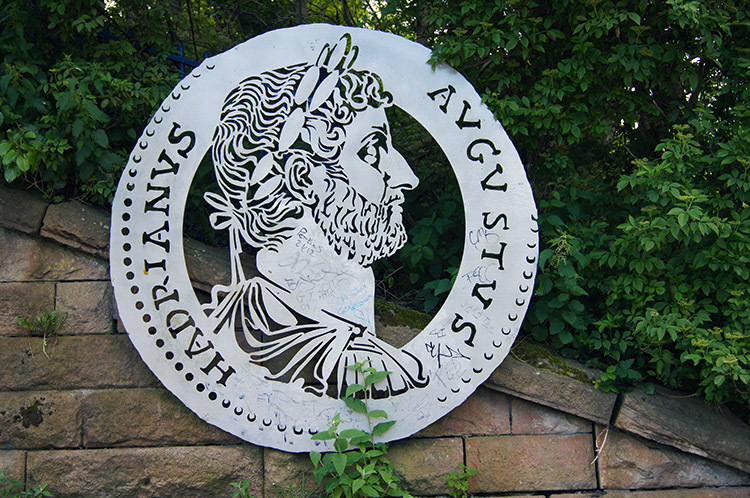 A more aesthetic diversion was a plaque to Hadrian set by a road bridge. After two miles of walking we dropped down to the riverside and things immediately improved. 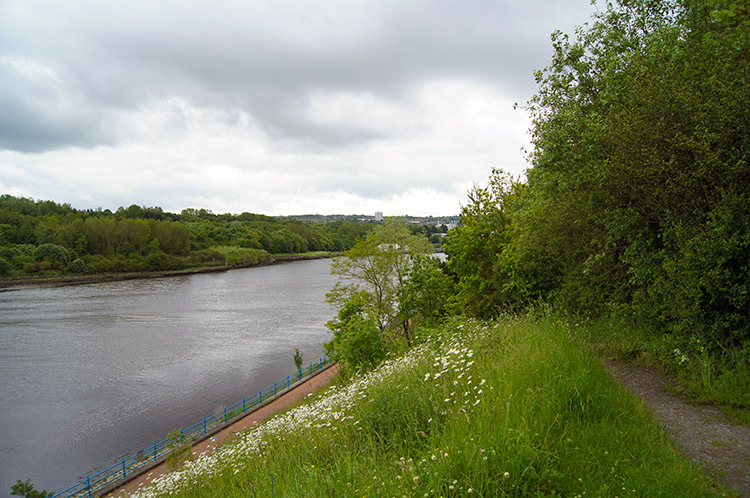 Litter was not entirely gone, but there was much less and the views upstream and downstream of the mighty River Tyne were interesting with old jetties interspersed with woodland fringes close to the edge of the river. 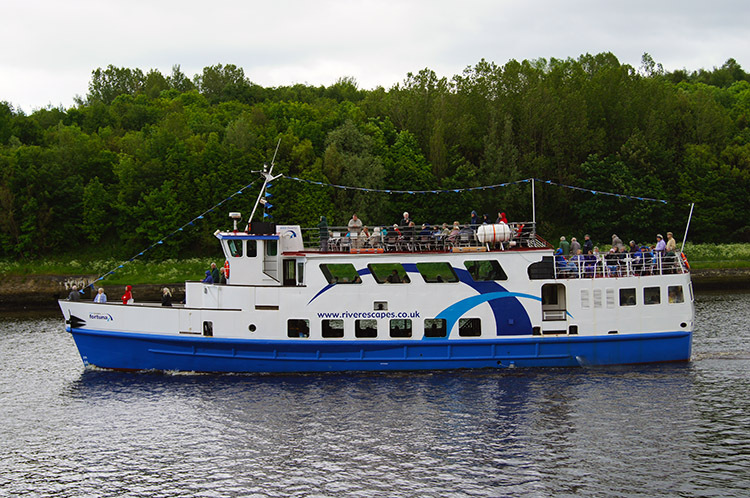 After a short while walking along the Tyne we passed a boat travelling downstream taking passengers on a river cruise. We looked at them while some of them looked attentively back. Curious folk? We walked on, sometimes imagining a wall of which there was no evidence. Three miles in to the walk and we were still dry. Rain was a possibility but it was holding off for us. 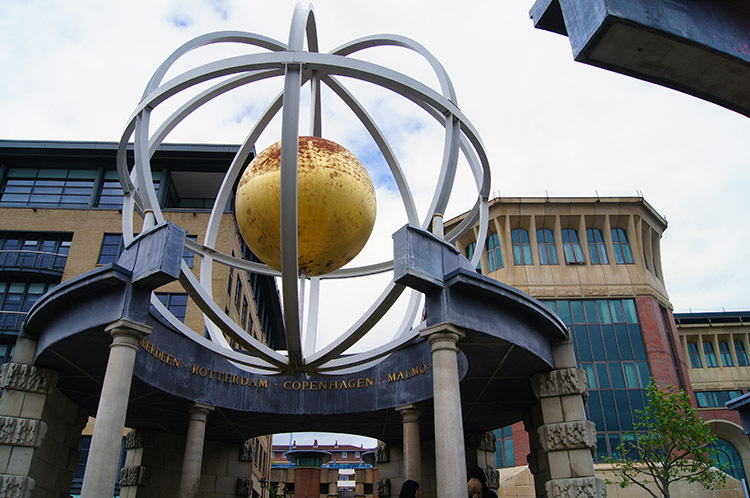 We continued on towards the city of Newcastle Upon Tyne. Our next point of interest was St. Peter's Marina, situated one mile from Newcastle city centre and seven miles from the river mouth. The marina has room for 120 boats and there were quite a few in residence though one or two hadn't seen the river for quite some time and some had even given up the ghost and sunk to the bottom of the marina. Quite a sight of neglect amidst some fine examples of boats, the better ones being a pretty penny or two to keep in good order for sure. From St. Peter's Marina we also saw the quality of Newcastle's marine heritage for the first time with the draw being the famous city centre bridges. First in line was the new Millennium footbridge built in 2000, then the Tyne Bridge and more bridges in the distance. 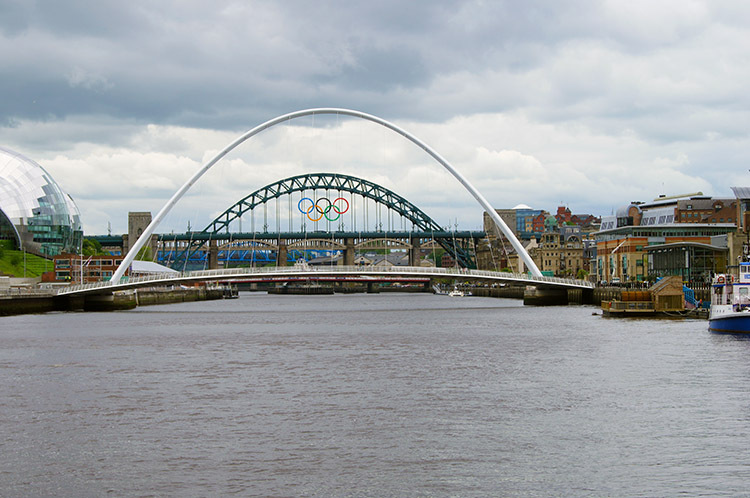 From our position the Tyne Bridge which was sporting the 2012 Olympic Rings was perfectly framed by the Millennium Bridge. It was a lovely picture. Other fine buildings also came into prominence as we approached the city. The first remarkable building to catch our attention was the Baltic Flour Mill which I confess looked much older to me that it actually is. The mill was designed in the late 1930's but not actually opened until 1950. I presume a world war delayed matters. It was opened as a working flour mill by Rank Hovis with a silo capacity of 22,000 tonnes. 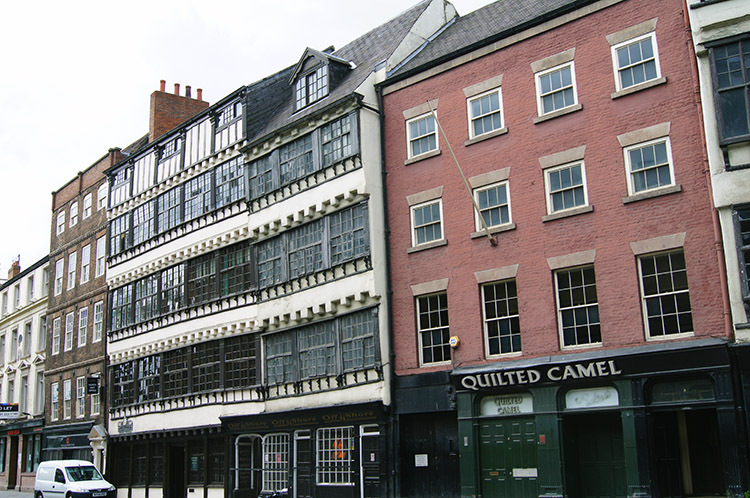 It was equipped with the most modern and efficient machinery of the time, a remarkable standard for north east England and in its heyday the building employed around 300 people. Now it is the Baltic Centre for Contemporary Art, an international centre of renown which presents a constantly changing programme of exhibitions and events. 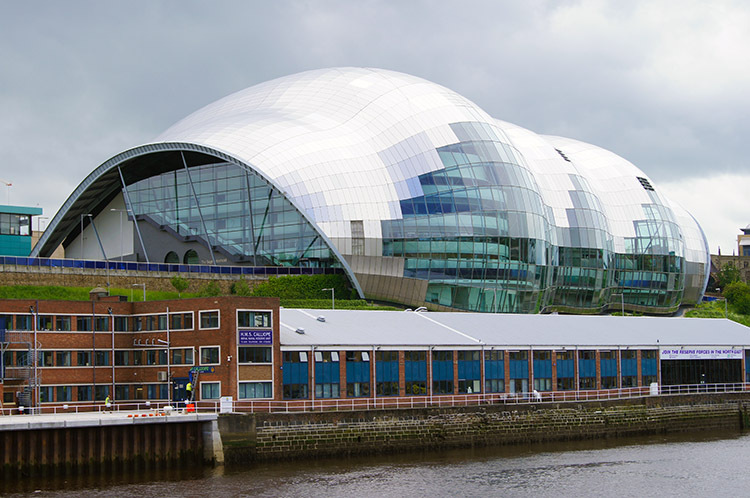 Beside the BALTIC on the south bank of the Tyne is another entrancing sight, the SAGE which is a a curved glass and stainless steel building and is the central location for music and arts events in the north east. 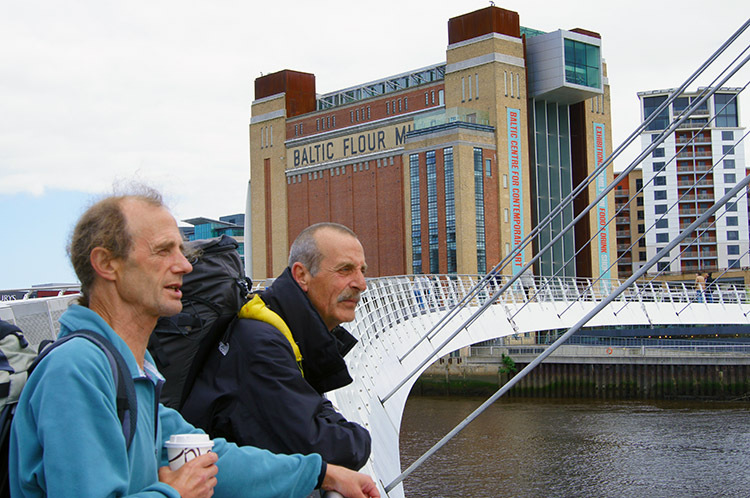 These two buildings, the BALTIC and SAGE stand either side of the Millennium Bridge providing a spectacular view for all visitors to Newcastle and the Tyne, including Hadrian's wall walkers such as ourselves. The view stopped us in our tracks. There were more beautiful buildings to enjoy during the final stage of the walk from the banks of the River Tyne to our hotel, the most striking being Bessie Surtee's house which is in fact two five-storey 16th and 17th century merchants' houses and amongst the finest examples of Jacobean domestic architecture, with some splendid period interiors. We did not see the inside, only the exterior as we passed along the road and then past the Life Science Centre before reaching our hotel. We had completed the first stage of the Hadrian's Wall walk without seeing any real evidence of a wall. Would the Romans have needed much with the river acting a natural barrier? Overall the city wall was interesting for other reasons, not least the magnificent Tyne and the superb buildings by its side. Tomorrow we leave the city and its buildings behind to head out into open country. Will we see evidence of the wall then?